Take the worry out of compliance with our website accessibility compliance solutions! Aurora offers a full range of accessibility consulting services including: website accessibility audits, conformance planning, Section 508 and WCAG 2.0 conformance evaluation & remediation, accessibility compliance certification, and conformance monitoring. Our accessibility assessment and consulting services will help your business or organization comply with the Americans with Disabilities Act (ADA) and Federal Accessibility Guidelines (i.e Section 508 of the Rehabilitation Act). Aurora provides website accessibility audits to identify and document major barriers to accessibility, and to determine the scope of testing and repairs needed to conform to Section 508 and WCAG guidelines. During a preliminary review, Aurora staff will test a small sample of pages on your site with both automated and manual tools (i.e. Wave Evaluation Tool and NVDA screen reader). When we’ve completed a review of your website, we’ll provide a detailed report documenting any errors and providing actionable guidance and recommendations to move forward with accessibility repair and remediation. Aurora offers accessibility conformance planning for businesses and non-profits seeking to achieve compliance with Section 508 and WCAG 2.0. Our conformance planning solutions include needs assessment and analysis, page selection, and process development to streamline accessibility compliance testing. Our accessibility experts will work with you to identify a target conformance level (i.e. WCAG 2.0 priority AA, AAA, etc), and outline a comprehensive plan to achieve compliance. Aurora provides website accessibility repair and remediation services for website pages, templates, style sheets, documents, and multimedia content. Our accessibility remediation and repair services include: template and theme repair, content and style sheet updates, video captioning, document repair, and more. Once we’ve completed repairs to your website, we’ll re-test pages to verify conformance and update reports to document progress towards compliance. Aurora provides website accessibility evaluation services to verify conformance with Section 508 and the W3C’s Web Content Accessibility Guidelines (WCAG 2.0). Our accessibility conformance evaluations include: comprehensive accessibility testing with both automated and manual tools (including a screen reader), real-time reporting of accessibility test results, and documentation of accessibility barriers for further testing and repair. 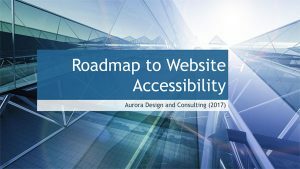 Aurora provides accessibility compliance certifications for websites that conform to section 508 and WCAG 2.0. Our compliance certifications are the product of an accessibility conformance evaluation, and can be used to make accessibility conformance claims for Section 508 and WCAG compliance. Ensure that your website stays compliant with our accessibility conformance monitoring services. As your partner in compliance, we’ll monitor your website for accessibility problems and address issues as they arise. Our Section 508 and WCAG compliance monitoring services include monthly scan results and reporting—and will help you maintain compliance as your website grows.